Who can fail to be drawn into the intriguing and fascinating world of the ‘Bo-men’? Created by outstanding sculptress and artist Daisy Boman, they are at first glance anatomically alike and uniform and yet Boman’s unique manipulation of each figure starkly portrays the human condition in all its richness and fragility. Her work depicts a collective goal, evoking a sense of belonging, a united community, or destiny. Sometimes dozens of her ‘Bo-men’ characters strive, climb and struggle for the same goal. In contrast, a lone ceramic figure, or pair of figures are distanced by white space, powerfully communicating emotions of the need for human trust or togetherness. Boman whimsically draws the spectator into a subtle humoristic view of his own life story, but as if in a tense piece of cinema, she builds tension so that you soon discover how philosophically serious the story is. Her seemingly humorous little men characterise a much deeper significance and worth. Their rich subtext provides a unique commentary on how we handle life’s personal challenges, disputes and hurdles. Boman lived in South Africa in the early 1980s and her astounding talent won her praise, recognition and a pre-eminent place at national exhibitions. But Boman was deeply troubled by the racial discrimination and segregation that was the product of Apartheid and after returning home to Belgium in 1986 her inner turmoil gave birth to the ‘Bo-men’. Her world of humanity riles against the abhorrence of racial segregation. Boman believes we are all ‘from the same mould’, inured by the society in which we dwell, so each ‘Bo-man’ has a face without features. Their form transcends race and nationality and connects with the common thread of humanity. They are without colour and the white clay bakes almost ironically into the colour of mourning, it is the hue of pain and sympathy, but it also represents hope, the sun and life. 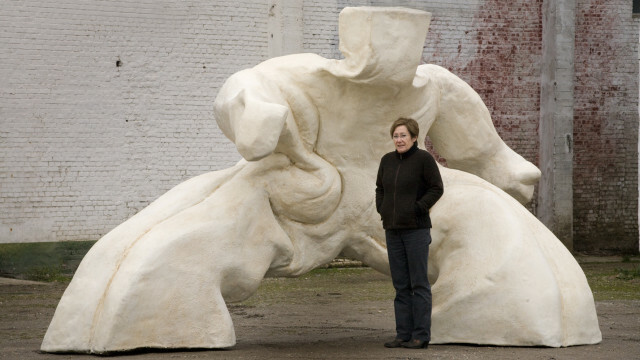 The supple and malleable clay, like the human form, is hardened by exposure and cracks – giving each individual form his own unique human character. Boman’s work is conceived from her distinctive self-expression: plain, simple and contemplative in manner, she offers us a satisfying and ‘unique look at ourselves’. The sculptress reminds us that we are not all that different from anyone else in the world, for we all share the same struggle to define our everyday lives. Daisy (1948) studied art at the Sissa school in Antwerp. She then followed a course in interior design and ceramics at the Academy of Fine Arts in Mol. In her atelier in Johannesburg she developed her own personal style. She was selected to become a member of ‘The Association of Potters of S.A’ and the ‘Artist Under the Sun Association’. Square in face, their heads symbolise an unbending resistance to life’s challenges. Boman believes we are all ‘from the same mould’, injured by the society in which we dwell. After several exhibitions in Belgium, France, the Netherlands and Great Britain, her work was discovered by the Halcyon Gallery in London who proposed to represent her work worldwide. There was a major exhibition of Boman’s work in the Halcyon Gallery, 29 Bruton Street and at the same time in New Bond Street, London in November 2008. Her artworks are sold all over the world.